Charles Darwin University staff and students will join the wider community to mark Mabo Day, with celebrations at Palmerston campus on June 3. Charles Darwin University staff and students will join the wider community to mark Mabo Day. The Indigenous Academic Support Unit, Duwun, is organising the celebration at the Palmerston campus on Wednesday, 3 June to celebrate the 17th anniversary of the decision by the High Court of Australia to recognise native title. The event will open with a seminar by Associate Professor Matthew Storey, of CDU’s School of Law and Business, who will speak about the importance of this decision for Torres Strait and Aboriginal people. 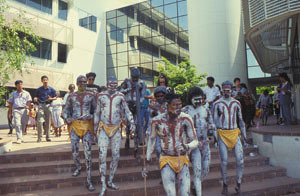 A performance from the Murray Island Mer Peibre Dance Troupe is scheduled. Coordinator of the event, Veronica McClintic said she anticipated the dancers would ignite the celebratory spirit. “The day is a commemoration, but it’s also a celebration of the High Court’s historic decision,” Ms McClintic said. “We’re also hoping that through the event we will be able to show staff, students and the residents of Palmerston and others, the range of services that is provided at the Palmerston campus, including the support offered to Torres Strait and Aboriginal students through the Duwun office. Events will begin at 11.30am, and refreshments and a complementary light lunch will be served from 12.15pm. The event is free, but bookings are necessary for catering purposes. A free bus will transport people from Casuarina to the Palmerston campus for the event. For more information and to register for the event, contact Veronica McClintic P: 8946 7860 or E: veronica.mcclintic@cdu.edu.au.